It’s finally happened, the more than two-decade “hiatus” in global warming has been broken, rather ironically, by an incredibly strong, naturally-occurring El Niño. The current El Niño is incredibly strong, and it was likely a major reason the global average surface temperature was the warmest on record in 2015. Satellites, which measure temperatures in the bulk atmosphere, are sensitive to El Niño events, like the super-El Niño that hit in 1998. “I expect that as this El Nino winds down, the temperature spike in the atmosphere will wane, and if a La Nina follows, temperatures will noticeably drop,” Knappenberger said. “While the Arctic temperature anomaly is large, big temperature swings in the Arctic region aren’t unusual, especially during the winter months,” according to Christy, Alabama’s state climatologist who compiles satellite temperature data with his colleague Dr. Roy Spencer. 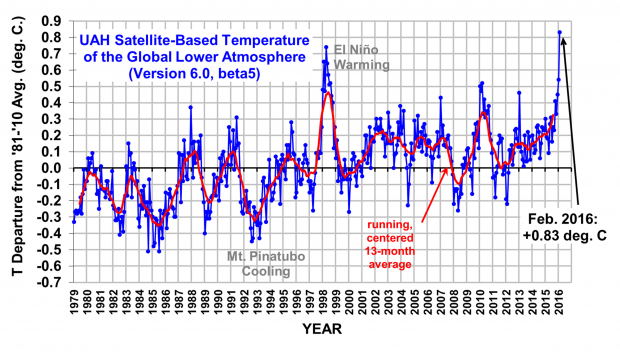 For more than 21 years, UAH satellite data has shown no statistically significant global warming, a phenomenon which has been dubbed the “hiatus” in warming. While February’s temperature spike has ended the 21-year hiatus in global warming, it remains to be seen if it’s only a temporary spike or part of a longer trend. If the Arctic warm spot subsides, the “hiatus” in warming could return. While February is smashing records, satellite data showed 2015 was only the third-warmest year on record. Surface temperature readings, on the other hand, claimed last year was the hottest ever recorded. “February’s warmth, which may bust a ‘pause,’ probably will not mark the beginning of a prolonged rapid temperature rise,” Knappenberger told TheDCNF.